About Ketut A. Message Ketut A. We had a wonderful day with Ketut and enjoyed the flexible itinerary. He was very knowledgeable and we appreciated learning more about Bali. Really enjoy his hospitality and we learnt a lot from him. Would recommend him to my other friends. Ketut was an exceptional guide! We were so blessed to have him spend the day with us. He was courteous, prompt, so very accommodating of our wishes and oh so very knowledgeable of the history and culture of this magical land! I recommend him without reservation. TOUR GUIDE RESPONSE: Hi Carl, Thank you for the review. And you all are great people. Hope to serve you again oneday. All the best for you and family. Ketut A.
Ketut took me on an amazing tour taking in Lempuyang Temple, Tirta Gangga Water Palace, Tukad Cepung Waterfall, Satria Coffee Plantation and the Sacred Monkey Forest Sanctuary. It was a long day, and one of the most amazing days I've ever had. Ketut is very friendly, professional and knowledgeable on the places we visited and on everywhere in between, educating me on all things Bali along the way. Also lunch with a beautiful view over the paddy fields with the volcano as a backdrop. Totally amazing. TOUR GUIDE RESPONSE: Hi Paul, Thanks a lot for the rating. I am glad that we fullfill each other. Enjoy the cruise and will wait for your next visit. All the best, Ketut A. We were happy to share our experience on the Ubud tour on nov.30, 2018. We had a late flight out of Bali, and booked with Ketut A. Ketut accommodated our logistic, and loaded four of us and luggage (24" each) to pick up from the cruise port, touring Ubud, then dropped us to the airport, on time within the six hour time frame. Ketut is friendly, easygoing, pleasant, and fluent in English. He is knowledgeable in the Bali religion and cultures, and explained to the point. Suggest WhatsApp for contact. TOUR GUIDE RESPONSE: Dear Raymond and Friends, It was a pleasure having you, touring with me into Ubud and surrounding. Thank you for the review, I personally highly appreciate it. Hoping you had a memorable short time frame touring Bali, until next visit. All the best, Ketut A.
Ketut Artawa has been a great host for us in Bali today. He accommodated all our needs and requests, and made us feel comfortable and welcome. 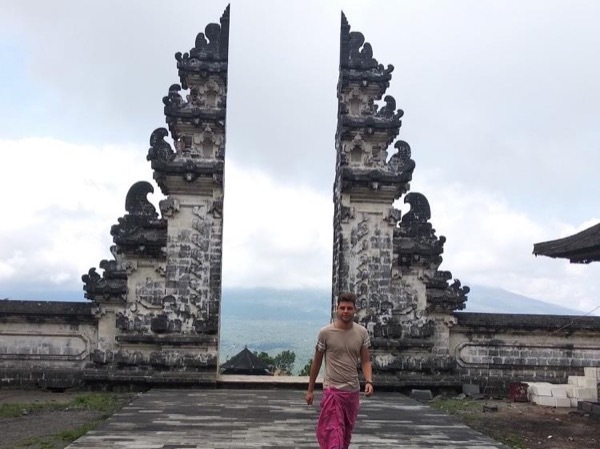 He provided us with several cultural information about Bali lifestyle and traditions, giving an added value to the tour. Highly recommended! TOUR GUIDE RESPONSE: Thank a lot, Paola and Michela. It was a great pleasure touring with you today. Will be waiting for your contact on your next visit. Have a great time. All the best, Ketut A. We spent a wonderfull day with Ketut, who was flexible in the program we made due to weather conditions, and gave us a lot of explanation in very good english on Bali history and things to know. Ketut knows well Bali but as a traveler himself can connect well with Europeans. Highly recommended. Great overview of Balinese culture and some of the agricultural highlights. Ketut is very knowledgeable and speaks amazing English. What a marvelous tour! My husband and I agreed we learned more about the people and culture of Bali from Ketut in one day than from any tour we have ever taken. We are experienced travelers and have had many private tours. Ketut rates up there with the best. He was a kind, thoughtful and very knowledgable guide. We highly recommend Tours by Locals and Ketut! This tour was very nice. Ketut was knowledgeable about the area we visited and provided history on Hinduism as well as Balinese culture. During the drive and walking tour of Uluwatu he was ingormative and answered questions. For the beach we stopped at and for the kecak performance he left us to experience it on our own. This was a good approach for me. it was a beautifully spent time in bali! ketut was effective in giving me a general orientation of the place, its culture, religious practices and life in general. true to its being a private tour, the day was tailored to my pace and interests. Ketut is a good guide. We did the half day Heritage tour which included two temples and rice terraces. The temples were interesting but we did not find the rice terraces worth the drive. Next time we'll have Ketut show us some of the beautiful beach resorts. Ketut is a star. We needed to get to our hotel in the north west (long drive!) and couldn't have asked for a better way to get there from the airport. Ketut had planned a route including coffee testing, temple on the lake, beautiful views of the twin lakes and a scenic route through the mountains. Conversations with Ketut are entertaining and enlightening, he is pleasant company and generous with his knowledge. Our Bali experience wouldn't have been the same without him. Thanks Ketut! TOUR GUIDE RESPONSE: Thank you Krista Highly appreciate you send us your positive feedback. Will always do my best and see you on your next visit. All the best, Ketut A. TOUR GUIDE RESPONSE: Dearest Jacques and friends, Thank you for the Rating. Hope you enjoyed the tours with me and consider to book me again when you plan on coming back. All the best, Ketut A. TOUR GUIDE RESPONSE: Dearest Jacques, Thank you so much for the rating. I am happy that you are happy. See you next time. All the best, Ketut A.
Mr. Ketut was excellent. I have used tour guides in many places, and he is one of the best: knowledgeable, flexible, punctual and polite. Most importantly he is very trustworthy and honest: No pushing shopping on us (very common among cheaper guides) and even refunded some fees for attractions we did not attend (by our choice). All in all, highly recommended!